I seem to have participated in this. Just got excited, I guess. I'm usually more phlegmatic. Evidently, the defenders of the CO2-greenhouse thesis refuse to accept any reproducible calculation as an explanation and have resorted to unreproducible ones. A theoretical physicist must complain about a lack of transparency here, and he also has to complain about the style of the scientific discussion, where advocators of the greenhouse thesis claim that the discussion is closed, and others are discrediting justified arguments as a discussion of "questions of yesterday and the day before yesterday". In exact sciences, in particular in theoretical physics, the discussion is never closed and is to be continued ad infinitum, even if there are proofs of theorems available. Regardless of the specific field of studies a minimal basic rule should be fulfilled in natural science, though, even if the scientific fields are methodically as far apart as physics and meteorology: At least among experts, the results and conclusions should be understandable or reproducible. And it should be strictly distinguished between a theory and a model on the one hand, and between a model and a scenario on the other hand, as clarified in the philosophy of science. That means that if conclusions out of computer simulations are to be more than simple speculations, then in addition to the examination of the numerical stability and the estimation of the effects of the many vague input parameters, at least the simplifications of the physical original equations should be critically exposed. Not the critics have to estimate the effects of the approximation, but the scientists who do the computer simulation. "Global warming is good … The net effect of a modest global warming is positive." (Singer). In any case, it is extremely interesting to understand the dynamics and causes of the long-term fluctuations of the climates. However, it was not the purpose of this paper to get into all aspects of the climate variability debate. The point discussed here was to answer the question, whether the supposed atmospheric effect has a physical basis. This is not the case. In summary, there is no atmospheric greenhouse effect, in particular CO2-greenhouse effect, in theoretical physics and engineering thermodynamics. Thus it is illegitimate to deduce predictions which provide a consulting solution for economics and intergovernmental policy. Another country heard from. Thanks to Louis D. Nettles, one of Jerry Pournelle's correspondents. It used to be one way, then it changed, then it changed again, and you know, it might change again! What a wild idea. ScienceDaily (Nov. 14, 2007) — A team of NASA and university scientists has detected an ongoing reversal in Arctic Ocean circulation triggered by atmospheric circulation changes that vary on decade-long time scales. The results suggest not all the large changes seen in Arctic climate in recent years are a result of long-term trends associated with global warming. The team, led by James Morison of the University of Washington's Polar Science Center Applied Physics Laboratory, Seattle, used data from an Earth-observing satellite and from deep-sea pressure gauges to monitor Arctic Ocean circulation from 2002 to 2006. They measured changes in the weight of columns of Arctic Ocean water, from the surface to the ocean bottom. That weight is influenced by factors such as the height of the ocean's surface, and its salinity. A saltier ocean is heavier and circulates differently than one with less salt. The very precise deep-sea gauges were developed with help from the National Oceanic and Atmospheric Administration; the satellite is NASA's Gravity Recovery and Climate Experiment (Grace). The team of scientists found a 10-millibar decrease in water pressure at the bottom of the ocean at the North Pole between 2002 and 2006, equal to removing the weight of 10 centimeters (four inches) of water from the ocean. The distribution and size of the decrease suggest that Arctic Ocean circulation changed from the counterclockwise pattern it exhibited in the 1990s to the clockwise pattern that was dominant prior to 1990. "Our study confirms many changes seen in upper Arctic Ocean circulation in the 1990s were mostly decadal in nature, rather than trends caused by global warming," said Morison. Thanks to Bill Quick at Daily Pundit. The GRACE satellites were previously mentioned here in Canada still affected by the last ice age. SteveF at Daily Pundit links to the greatest thing since cold fusion. Not quite a Shipstone, but awfully good! Ever since the local power company shut down our local (coal-burning) power plant, then was bought out by the big regional power company, I have hoped to see local nodes return to the grid. In the old days, when the coal-burning plant was still on line, regional blackouts did not affect the island, since we had local power. Theo has found The Greatest Movie Line ever!!! Transcript in first comment below, for the hard of hearing. Update: Theo's link no longer works: try this one instead. Speaking as a misfit unassimilated foreigner, I think of Thanksgiving as the most American of holidays. Christmas is celebrated elsewhere, even if there are significant local variations: In Continental Europe, naughty children get left rods to be flayed with and lumps of coal; in Britain, Christmas lasts from Dec. 22 to mid-January and celebrates the ancient cultural traditions of massive alcohol intake and watching the telly till you pass out in a pool of your own vomit. All part of the rich diversity of our world. But Thanksgiving (excepting the premature and somewhat undernourished Canadian version) is unique to America. "What's it about?" an Irish visitor asked me a couple of years back. "Everyone sits around giving thanks all day? Thanks for what? George bloody Bush?" Well, Americans have a lot to be thankful for. Three hundred and 14 years ago, the Pilgrims thanked God because there was a place for them in this land, and it was indeed grand. The land is grander today, and that, too, is remarkable: France has lurched from Second Empires to Fifth Republics struggling to devise a lasting constitutional settlement for the same smallish chunk of real estate, but the principles that united a baker's dozen of East Coast colonies were resilient enough to expand across a continent and halfway around the globe to Hawaii. Americans should, as always, be thankful this Thanksgiving, but they should also understand just how rare in human history their blessings are. Prosperity, democracy, liberty: these are not normal conditions of humanity. They are rare and usually fleeting. Take them for granted, cease to guard them, and they will soon be gone. RTWT and give thanks. Is music encoded in da Vinci's Last Supper? ROME, Italy (AP) -- It's a new Da Vinci code, but this time it could be for real. 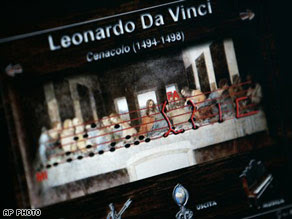 A laptop screen shows musical notes encoded in Leonardo Da Vinci's "Last Supper." An Italian musician and computer technician claims to have uncovered musical notes encoded in Leonardo Da Vinci's "Last Supper," raising the possibility that the Renaissance genius might have left behind a somber composition to accompany the scene depicted in the 15th-century wall painting. "It sounds like a requiem," Giovanni Maria Pala said. "It's like a soundtrack that emphasizes the passion of Jesus." Painted from 1494 to 1498 in Milan's Church of Santa Maria delle Grazie, the "Last Supper" vividly depicts a key moment in the Gospel narrative: Jesus' last meal with the 12 Apostles before his arrest and crucifixion, and the shock of Christ's followers as they learn that one of them is about to betray him. Pala, a 45-year-old musician who lives near the southern Italian city of Lecce, began studying Leonardo's painting in 2003, after hearing on a news program that researchers believed the artist and inventor had hidden a musical composition in the work. "Afterward, I didn't hear anything more about it," he said in an interview with The Associated Press. "As a musician, I wanted to dig deeper." In a book released Friday in Italy, Pala explains how he took elements of the painting that have symbolic value in Christian theology and interpreted them as musical clues. Pala first saw that by drawing the five lines of a musical staff across the painting, the loaves of bread on the table as well as the hands of Jesus and the Apostles could each represent a musical note. This fit the relation in Christian symbolism between the bread, representing the body of Christ, and the hands, which are used to bless the food, he said. But the notes made no sense musically until Pala realized that the score had to be read from right to left, following Leonardo's particular writing style. In his book -- "La Musica Celata" ("The Hidden Music") -- Pala also describes how he found what he says are other clues in the painting that reveal the slow rhythm of the composition and the duration of each note. The result is a 40-second "hymn to God" that Pala said sounds best on a pipe organ, the instrument most commonly used in Leonardo's time for spiritual music. A short segment taken from a CD of the piece contained a Bach-like passage played on the organ. The tempo was almost painfully slow but musical. You'd have to play it slow, to make it last 40 seconds. I suspect we have a case of the Law of Fives here, but maybe I've just seen too many conspiracy theories. Just one of those things you have to try, like emu burgers at Sunfest. Since the embed code for the graphic includes a link [removed] to a site offering usurious loans, and a hotlink [also removed] for the image, it is a form of spam, isn't it? But just too tasty to pass by. Would they even bother to check reading level, whatever is meant by that. If The Volokh Conspiracy is junior-high level and Rand Simberg is high-school level; and bloggers at those sites are smarter than I am (they are, you know); then maybe I ought to try writing a bit differently? What? And compromise my artistic integrity? They don't pay me enough for that! Update: Further research on this at The Periodic Table. Glenn Reynolds, linking to George Monbiot at the Grauniad, says "BIOFUELS are now officially evil." Monbiot (rhymes with moonbat), a leader among the global warmingists, has been writing to this effect about biofuels for a while. A few months, anyway. Which shows that a stopped clock, and so on. Now Jerry Pournelle's readers enter the fray. Dr. Pournelle says, "We don't need the ethanol in the first place. Better we produce gallons and gallons and make every Senator and Member of Congress drink two quarts a day of absolute alcohol diluted however they like. They couldn't do worse, could they?" It's starting to get confusing: since pollution cools the Earth, the Greens ought to be in favor of burning more stuff, but they don't want to burn stuff, since that liberates carbon, making more CO2, which warms the Earth, which is bad; but pollution is bad, and so is drilling for oil, which results in burning stuff, which would cool the Earth, which would alleviate Global Warming™, which would be good, except for the pollution, which defiles Mother Gaia. Maybe I'll try to diagram this. Not right now. It's important (isn't it?) to avoid the Fallen Angels scenario. By the way, I'm seriously tired of seeing Walt Kelly's line "We have met the enemy, and he is us" used about all kinds of things that have nothing to do with littering! Pogo the possum was talking about littering! Tires in the creek, and that sort of thing. Dammit. Carelessness, not evil or subversion. Here previously: Biofuel problems, Progress on biofuels, Ethanol scam at Rolling Stone. Glenn Reynolds has a roundup of reactions. Sure it's a word. If you can have alarmists, you gotta have alarmism. It's in the Telegraph: The deceit behind global warming. It's no news that the Bush Administration has done a horrible job of selling itself and its policies. Bush, being a Texan, evidently believes that accomplishments speak for themselves. But the great world, unfortunately, is not Texas. If you don't create your own narrative, lay down your own version of events, someone else is going to do it for you. And you probably will not like the results. The reason that the anti-war side is winning the propaganda war (or if you'd rather use a term with less pejorative connotations, "war of words" is because this administration has systematically failed to make the case for what we're doing in Iraq, why it's important we're there, how we're going to move forwards, and what the consequences of surrender would be. The current administration has failed, over and over again, even the most basic communications competency, and in a democracy, that's a fatal flaw, because when you're doing something important and the people turn against you, ceteris paribus, in due course they're going to reassert themselves and shut it down. If we now yank troops out, it won't be because of the myriad failings in the conduct of the war itself, it'll be because the administration has failed to carry the public. Thanks for the Dunn piece to Gagdad Bob, who says, among much else,"There is no sanctimonious moral scold like leftist moral scold -- for example, you are the moral equivalent of Hitler if you don't believe in Al Gore's weather hysteria." Both linked posts are worth a RTWT. And see It's cold on Presidents' Day, here in February. Commenter Bill Higgins at Making Light mentions a new musical instrument, the Zeusaphone. If you found that interesting, do click through to the Youtube page, where there is some information on the instrument and its builder, Steve Ward. Oh dear. This would be tough on the roadies, if you wanted one for your band. Here's a duet on "Dance of the Sugar Plum Fairy." This double coil has a more mellow tone. Hillary! finds GWB's analogies "faulty and offensive"
“George Bush’s faulty and offensive historical analogies aren’t going to end the war in Iraq, make America safer or bring our troops home. Americans are tired of the President’s efforts to play politics with national security and practice the politics of division. We must take the words of the enemy seriously. The terrorists have stated their objectives. They intend to build a totalitarian Islamic empire -- encompassing all current and former Muslim lands, stretching from Europe to North Africa, the Middle East and Southeast Asia. In pursuit of their imperial aims, these extremists say there can be no compromise or dialog with those they call infidels -- a category that includes America, the world's free nation [sic], Jews, and all Muslims who reject their extreme vision of Islam. They reject the possibility of peaceful coexistence with the free world. Again, hear the words of Osama bin Laden last year: "Death is better than living on this Earth with the unbelievers among us." History teaches that underestimating the words of evil, ambitious men is a terrible mistake. In the early 1900s, the world ignored the words of Lenin, as he laid out his plans to launch a Communist revolution in Russia -- and the world paid a terrible price. The Soviet Empire he established killed tens of millions, and brought the world to the brink of thermonuclear war. Bin Laden and his terrorist allies have made their intentions as clear as Lenin and Hitler before them. And the question is: Will we listen? America and our coalition partners are listening. We have made our choice. We take the words of the enemy seriously. Over the past six years, we have captured or killed hundreds of terrorists. We have disrupted their finances. We have prevented new attacks before they could be carried out. We removed regimes in Afghanistan and Iraq that had supported terrorists and threatened our citizens, and in so doing, liberated 50 million people from the clutches of tyranny. I'm baffled trying to sort this out. Certainly those two were greater villains, in the sense that they killed greater numbers, so is she taking Osama's side, suggesting that the President is being mean to bin Laden by comparing him to those two? Or were Lenin and Hitler the ones being unfairly maligned? These are the questions that Hemingway was wondering about when he asked the leaders of the Communist Party USA and American Nazi Party if they felt offended by the President's analogies. So if you’re keeping score, Hillary Clinton finds Bush’s historical analogy, comparing Osama Bin Laden to Hitler and Lenin, wrong and offensive. She is joined by the Communist Party USA, who also find the analogy offensive — apparently because Lenin didn’t do anything wrong. The American Nazi Party is, frankly, flattered by the comparison — which it gleefully extends to George Washington for reasons only a mental health professional knows. And everybody involved hates George W. Bush. Somehow I doubt these are the ideological compatriots Clinton was seeking out when she suggested that the President’s analogy was “faulty and offensive.” But if the American Nazi Party and Communist Party USA are not the company in which Clinton wishes to place herself, then what did she mean? I, for one, would be grateful for some clarification about exactly how evil the Senator regards Osama Bin Laden — if he’s not fairly mentioned in the same breath as Hitler and Lenin. Otherwise, I might suggest that the Senator’s Clintonian parsing has gotten out of hand. Or have we really reached a point at which it depends on what your definition of “megalomaniacal threat to Western civilization” is? We can have confidence in this cause because we have seen the power of liberty to transform nations and secure peace before. Here at the Heritage Foundation, you understand this better than most. During the Cold War, there were loud voices in Washington who argued for accommodation of the Soviet Union -- because they believed the watchword of our policy should be "stability." At Heritage, you knew that when it came to the Soviet Union, the watchword of our policy should be "freedom." Together with a great President named Ronald Reagan, you championed a policy of rolling back communism oppression and bringing freedom to nations enslaved by communist tyranny. And by taking the side of dissidents, who helped millions across the world throw off the shackles of communism, you helped build the free and peaceful societies that are the true sources of stability and peace in the world. And now we're at the start of a new century, and the same debate is once again unfolding -- this time regarding my policy in the Middle East. Once again, voices in Washington are arguing that the watchword of the policy should be "stability." And once again they're wrong. In Kabul, in Baghdad, in Beirut, and other cities across the broader Middle East, brave men and women are risking their lives every day for the same freedoms we enjoy. And like the citizens of Prague and Warsaw and Budapest in the century gone by, they are looking to the United States to stand up for them, speak out for them, and champion their cause. And we are doing just that. We are standing with those who yearn for the liberty -- who yearn for liberty in the Middle East, because we understand that the desire for freedom is universal, written by the Almighty into the hearts of every man, woman and child on this Earth. We are standing with those who yearn for liberty in the Middle East, because we know that the terrorists fear freedom even more than they fear our firepower. They know that given a choice, no one will choose to live under their dark ideology of violence and death. We're standing with those who yearn for liberty in the Middle East, because we know that when free societies take root in that part of the world, they will yield the peace we all desire. See, the only way the terrorists can recruit operatives and suicide bombers is by feeding on the hopelessness of societies mired in despair. And by bringing freedom to these societies, we replace hatred with hope, and this will help us to marginalize the extremists and eliminate the conditions that feed radicalism, and make the American people more secure. The lessons of the past have taught us that liberty is transformative. And I believe 50 years from now an American President will be speaking to Heritage and say, thank God that generation that wrote the first chapter in the 21st century understood the power of freedom to bring the peace we want. I know that when I discuss the war on terror, some here in Washington, D.C. dismiss it as political rhetoric -- an attempt to scare people into votes. Given the nature of the enemy and the words of its leaders, politicians who deny that we are at war are either being disingenuous or naive. Either way, it is dangerous for our country. We are at war -- and we cannot win this war by wishing it away or pretending it does not exist. Unfortunately, on too many issues, some in Congress are behaving as if America is not at war. The analogy would be faulty if there were no enemy, and offensive if Hillary! regarded herself as being depicted on the wrong side in the struggle between the "stability" and the "freedom" factions, or if she regarded the depiction of the accomodationists, the "stability" faction, as being in the wrong, as demeaning. The enemy is not Islam per se, nor any particular nation, which makes the enemy exceedingly difficult to define. Difficult to find, too; they hide among civilians and use them as shields as a matter of policy. The President's opponents, seeking advantage wherever they can, would like the public to confuse difficulty with impossibility, and then, the undefinable with the nonexistent. Should those opponents achieve the power they seek, they will have to choose. They can continue to defend Western civilization in whatever way they can, though the word "war" will by denied them by their own choosing. Or they can continue in their current path, denying the existence of an enemy, as we lose an embassy here, a warship there, airplanes, buildings, who knows what. This war has been going on over a thousand years. It warms, it cools, it continues. Some of the quiet spells have lasted over a century. But the first overseas enemies the US faced and defeated were the Barbary Pirates, 200 years ago. [The XYZ Affair fighting was closer to home, off our shores and in the Caribbean.] That was the first US battle in the war that we are fighting now. "Shores of Tripoli," as you remember. Which makes Bush the inheritor of the mantle of Jefferson. How about that! To get back to Hillary! 's statement for a minute: she finds the President's analogies "faulty and offensive," but does not tell us what their faults are, or in what way they offend. She goes on to say that the analogies will not accomplish the goals of ending the war, making America safer, of bringing the troops home. If the analogies had been less faulty, less offensive, would they have been able to do those things? Oh come on, they're analogies, mere words. They don't have the strength to accomplish anything. Although one sees this kind of magical thinking on the Left often enough: good intentions count more than actual deeds, words have power to make a difference in the physical world. Jizya, Danegeld, attrition, whatever. Do I ramble? A bit, a bit. I believe 50 years from now an American President will be speaking to Heritage and say, thank God that generation that wrote the first chapter in the 21st century understood the power of freedom to bring the peace we want. Of course this is historical in a projective sense, it's history that has not happened yet. But to one who thought her party should have been writing that chapter, and would have written it differently—that could be offensive. "It should have been us that that future President was/will be praising! Not them!" Maybe that's the one. Update: Interesting that Jay Tea at Wizbang! uses the Harper and Kipling quotes, in equally close proximity, on another topic. Great minds, you know. 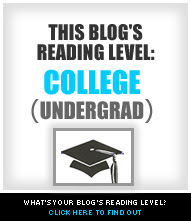 Having a college education does not entitle you to anything. If you did it right, it makes you more capable of something. This Washington Post article, Fulfillment Elusive for Young Altruists In the Crowded Field of Public Interest, occasions some comment at Transterrestrial Musings and Althouse. Commenter M. Simon at Transterrestrial says, "I have one year of college and wound up as an aerospace engineer. How did that happen? The degree is not the ticket. You are the ticket." The number of people going to college expanded enormously in the last century. That's hard to read without gridlines. It's from PBS, based on the Statistical Abstract. Click to see it better. Per capita, more college graduates now than high school grads in 1940; more college grads now than high school and college grads put together for the first 160 years or so of this country's existence. This is the kind of quantitative change that is large enough to become a qualitative change. Or it would be, if high school were as tough now as it was then, and likewise college. A good education is still available; but so are diplomas and degrees for time served and tuition paid. Publishers need new textbooks to sell, even in fields that have not changed. Professors of education need to publish new theories and methods. Children just need to learn arithmetic. Found a while back at Jerry Pournelle's place. Update, Nov. 28: Michelle Malkin and her commenters have plenty to say on this. The comments are particularly good, and they are not partisan. This is really not a partisan issue at all. Video of the parade, with drums, flowers, smiling children, at Perfunction. This can't be Bush-concocted propaganda, since it will never appear in the big newspapers or on broadcast TV, and after all, propaganda that isn't seen might as well not exist. Here's an article on the parade and related developments from the official Multi-National Force website. Smoking hookah pipes and drinking beer, Sarmad Ali joked and gossiped long into the night with a group of friends in Baghdad – a luxury they could not enjoy a few months ago because of the violence. Slightly tipsy, the young men piled into a minibus and drove to Palestine Street, until recently a no-go area after dark but now filled with traffic and pedestrians. They pulled up outside a recently opened late-night restaurant, which serves sheep’s head on bread, a favourite dish for Iraqi men after a few drinks. I wonder if you need a few drinks to eat that. Concurrent Technologies began two decades ago doing metalworking research in Pennsylvania's struggling rust belt. In the years since, the Johnstown, Pa., company has become a federal contracting chameleon. It is an intelligence adviser, an environmental consultant and a software engineering specialist. 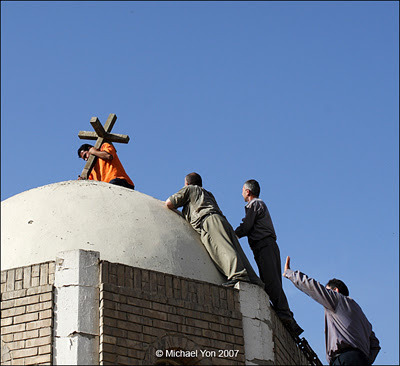 It has trained mine-detecting dogs and managed religion-based initiatives. It oversees construction projects, organizes conferences and studies ways to use hydrogen for fuel in Pennsylvania and South Carolina. Missile-defense research is part of its portfolio. So is the development of special armor for combat vehicles in Iraq and "solid waste technology" in Florida. And it is a nonprofit charity. Behind the rise of Concurrent is Rep. John P. Murtha (D-Pa.), chairman of the House Appropriations Committee's defense subcommittee, who helped arrange funding to launch the organization in 1988. Murtha has since arranged millions of dollars more in directed congressional appropriations called earmarks. Now Concurrent has nearly $250 million in annual revenue and 1,500 employees. It's a floor wax and a dessert topping! How do dey do dat? Unlike many other big contractors, Concurrent pays no income tax on most of its revenue. Unlike nonprofit, federally funded research-and-development corporations, it is not chartered by the federal government. According to Concurrent's chief financial officer, Edward J. Sheehan Jr., the Internal Revenue Service approved Concurrent as a charity because it "lessens the burden on governance" and helps "the federal government and American industry to perform more effectively through the use of emerging technologies." Comments are interesting, for once, at the WaPo. From ThatPoliticalBlog, via Glenn Reynolds. I suppose the Canadians might be in favor of a bit of warming. Global Warming: Doomsday Called Off. Back when I used to live in a university town, I would occasionally see a bumper sticker saying "Reunite Gondwanaland!" I wondered what the people with the "Free Tibet!" stickers made of that. Now, thanks to Luboš Motl, I find that it should have said "Reunite Pangaea!" Anyway, a happy (slightly belated) 127th to the pioneer of continental drift theory. The consensus was against him. Click through for maps, a portrait, and real discussion (more than this pitiful stub of a post). […] We discount the possibility that everything is caused by human actions, because everything we've seen the climate do has happened before. Sea levels rise and fall continually. The Arctic ice cap has shrunk before. One millennium there are hippos swimming in the Thames, and a geological blink later there is an ice bridge linking Asia and North America. Linked from Newsbusters and Eric Scheie, via Glenn Reynolds. Vincent Gray has begun a second career as a climate-change activist. His motivation springs from the United Nations' Intergovernmental Panel on Climate Change, a body that combats global warming by advocating the reduction of carbon dioxide and other greenhouse gases. Dr. Gray has worked relentlessly for the IPCC as an expert reviewer since the early 1990s. But Dr. Gray isn't an activist in the cause of enforcing the Kyoto Protocol and realizing the other goals of the worldwide IPCC process. To the contrary, Dr. Gray's mission, in his new role as cofounder of The New Zealand Climate Science Coalition, is to stop the IPCC from spreading climate-change propaganda that undermines the integrity of science.
" The Framework Convention on Climate Change (FCCC) 1992 defined 'climate change' as changes in climate caused by human interference with atmospheric composition," he explains. "The task of the IPCC, therefore, has been to accumulate evidence to support this belief that all changes in the climate are caused by human interference with the atmosphere. Studies of natural climate change have largely been used to claim that these are negligible compared with 'climate change.' "
Dr. Gray is one of the 2,000 to 2,500 top scientists from around the world whom the IPCC often cites as forming the basis of its findings. No one has been a more faithful reviewer than Dr. Gray over the years -- he has been an IPCC expert almost from the start, and perhaps its most prolific contributor, logging almost 1,900 comments on the IPCC's final draft of its most recent report alone. But Dr. Gray, who knows as much about the IPCC's review processes as anyone, has been troubled by what he sees as an appalling absence of scientific rigour in the IPCC's review process. "Right from the beginning, I have had difficulty with this procedure. Penetrating questions often ended without any answer. Comments on the IPCC drafts were rejected without explanation, and attempts to pursue the matter were frustrated indefinitely. "Over the years, as I have learned more about the data and procedures of the IPCC, I have found increasing opposition by them to providing explanations, until I have been forced to the conclusion that for significant parts of the work of the IPCC, the data collection and scientific methods employed are unsound. Resistance to all efforts to try and discuss or rectify these problems has convinced me that normal scientific procedures are not only rejected by the IPCC, but that this practice is endemic, and was part of the organization from the very beginning." Consensus? As Paul Reiter said to John Stossel, the IPCC is a political organization, not a scientific one.